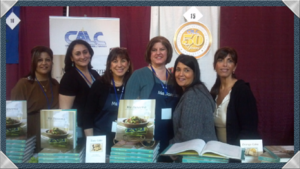 This page hosts a list of books on Chaldean Food & Recipes. If a book is missing, you can add it using the add a book form. Armenian Food: Fact, Fiction & Folklore/2nd Edition; by Irina Petrosian and David Underwood 2006, Yerkir Publishing. ISBN 1411698659 Food is the portal to Armenia’s past and present-day culture. This culinary journey across the land called Hayastan presents the rich history, wondrous legends, and fact-filled stories of Armenian cuisine. Simply Armenian: Naturally Healthy Ethnic Cooking Made Easy, by Barbara Ghazarian 2004, Mayreni Publishing. ISBN 1931834067 Firmly rooted in the cuisine while modernizing some dishes to make them lighter and less caloric. The book encompasses 150 dishes from peasant fare to banquet dishes. Armenian Food: Fact, Fiction & Folklore; Irina Petrosian and David Underwood; The 272-page book, presented as `Hayastan's first modern food guide written in English,' is not a recount of `how' but a fresh look at `why'.